This second floor apartment is a one minute walk to Bikini Beach, a beautiful white sand beach in the heart of Orient Bay. The apartment has 2 floors, on the upper level there is 1 bedroom with a king sized bed and another single bed and a full bathroom with a shower. Downstairs is a spacious living room with an adjacent balcony with sun beds and fans, perfect for evening cocktails. There are screens on all the windows, so you can enjoy the Caribbean breezes free from mosquito's. There is also air-conditioning throughout the apartment. The living area is on the lower floor and has an open kitchen, a full size dining table, a full sized refrigerator, microwave, dishwasher, and a washing machine. There is also a separate toilet with a sink. There is also radio with CD player. Next door are several exquisite local and international restaurants, beach-bars and a full service supermarket. All are located in the neighborhood. Nearby you will also find many other beautiful beaches. The locals are very multilingual, English is spoken widely and most restaurants and shops accept dollars. 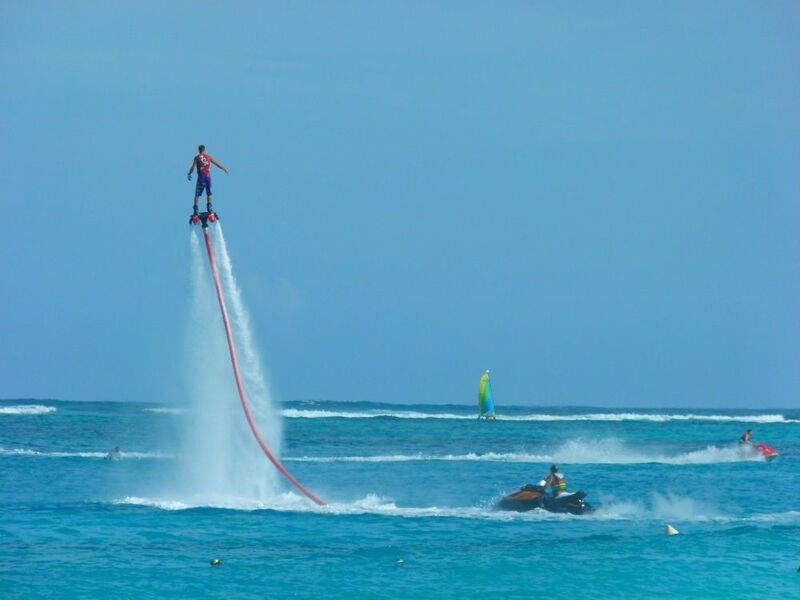 There are a lot of fun activities and sports offered at the popular sandy Bikini Beach: jet skiing, water-skiing, para-sailing, windsurfing, catamaran, speedboat, sailing, scuba diving, snorkeling, horse back riding and more. Nearby there are opportunities to see whales, dolphins, big turtles and a variety of amazing reef fishes in crystal-clear waters with beautiful lagoons. There is also a clothing optional beach that is about a 10 minute walk away. ...or walk along the powdery white sand beaches! The crystal clear turquoise ocean, a light breeze, and the warm sun on your skin. toilet, On the lower floor is a seperate toilet with a sink. One minute walk to Orient Bay. Only 70 meter or 80 yards to the beach. and every window with mosquito-protection. The washer is in the kitchen. 50% deposit paid at time of reservation. The remaining balance and the refundable damage deposit are payable 30 days before arrival. 100% refund if cancelled at least 60 days before arrival date. Final cleaning is included. Great location - such a wonderful experience! Well furnished and so friendly and helpful. We will definatly try to stay here again. the appliances are in excellent condition. The apartment has a good floor plan and easily accommodates 2 adults and could do 4 if you wanted. Having stayed in all types of properties in Orient Village am I going to tell you this is an over the top, opulent, super plush apartment? No. If that’s what you’re looking for this is not the apartment for you. Am I going to tell you we would and will definitely stay here again? YES! Like I stated earlier it has everything you could want is super clean and a great location to boot. It is one of the best “bang for your buck” apartments we have rented and Vero and the owners are great. See you soon Vero! The location is perfect - beach is beautiful, plenty of restaurants a short walk away, grocery store across the road and parking is never a worry. So glad we decided upon this apartment for our accommodations. We would gladly return and we would highly recommend. I traveled to St. Maarten alone visiting June 29th through July 4th 2017. I wanted to stay within walking distance to grocery stores, good places to eat and specifically Bikini Beach. The location was completely perfect as there were two grocery stores across the street and at least ten different places to eat across the street and around the corner. I was extremely pleased with the variety of food both at the grocery store and the restaurants. Also pleased with the condo as it was very clean, the air conditioning worked very well and Anna, who is the Land Lady was excellent. I have no complaints about the condo as all appliances were up to date, looked new and were working as they should function. Most importantly, Bikini Beach was right down the street past the grocery stores which was an easy walking distance. I was very happy with my choice. I felt very safe and had no problems at all. I will be staying at the property again, there is no doubt! I highly recommend this property. Enough shop nearby to buy essentials for snacks and breakfast in the apartment. Nice restaurant a 2 minute walk away, 3 mins after some nice wine! The beach is also 2 minutes walk, easy safe parking. Comfortable apartment all around, only drawback was the TV could only receive French channels,apart from the news. Sure some TV teckymight have been able to get more channels in English, but not me, or the folk before me. Other than that, with is a minor detail, everything was really nice, and if I return to St Martins again for a winter break, I would not hesitate to use the apartment again. Great apartment close to everything, beach , restaurants, grocery stores, shopping. Can eat out or cook in which ever you want. With the windows open you can sleep to the sounds of the waves every night. Will definitely return. The apartment is centrally located in Orient Bay, about 80 yards from the sandy Bikini Beach. Nearby you will also find many other beautiful beaches and a wide assortment of nautical activities. There's an activity for everyone. Exquisite local and international restaurants, beach-bars and shops are located in the neighborhood. 50% deposit paid at time of reservation. The remaining balance and the refundable damage deposit are payable 30 days before arrival. 100% refund if cancelled at least 60 days before arrival date.